Native American Flute Music Played from the Soul. My name is Alan Cleveland and one could say that the Native flute is my life or at least it has been for the best part of the last quarter century. My ancestors have lived in this country we call Turtle Island for thousands of years, and like so many of our people I have not found it easy to adapt to the white man's way of life. I make my living in the Native American community and have been a singer with several different Powwow drums and sell my flutes at these powwow's. It would seem that I owe most of whatever is left of my sanity to the hauntingly beautiful sounds that the wooden flute of my ancestors emits and I play it as it was originally intended, totally from my soul, without a lot of orchestration but tons of emotion. I entitled this CD "At Long Last, Shylo's Song" in honor and memory of my great friend and beloved dog "Shylo" who was always there for me through some very rough times in my life. He had developed a brain tumor which left him with horrible seizures that tore the very heart out of me to see his suffering and one night while I was standing the last watch with him and tuning a flute, I promised him that I would make a CD and name it after him. He crossed over the next day and I miss him every day even though I have always been blessed with wonderful animals in my life. The "at long last" part of the title comes from the length of time it has taken me to get around to get it recorded. The Haudenasaunee (Iroquois) people of my homeland in NY state and Ontario whom I am amongst all the time, and the Lakota, Cheyenne, Ojibwa & Cree whom I am with often, whom I have been promising to have a CD any day now for the last ten years, have been continually asking me if I had a CD done yet, and I can finally say yes! PS... This CD has 17 songs and lasts 72 minutes unlike so many half hour wonders, so I believe it is a very good value! The music on this CD really moved me. Loved every song and could feel the feelings that went into each of the songs by Alan. He truly knows how to make his flutes sing. The tremendous musical creativity that you hear on this CD can only be surpassed by Alan's incredible genious at creating the musical instruments he uses to produce it. He never compromises, and the end results are obvious when you view his flutes and hear his music. Perfection! Please save a copy of your next CD for me, Al...I'm looking forward to adding it to my collection! 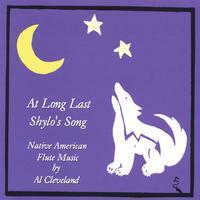 Its a most beautiful CD and love the song Shylo's song and you can hear the compassion and love in the flute that the artist had for his dog and i do have Cherokee in me and some how it take me back to my ancestors many moon ago. Outstanding CD - One of my favorites. This CD was amazing and inspiring. Any time I want to feel creative I put this on as mood music. The rhythm and melodies are wonderous throughout every song. I am so honored that I own this CD. The first time I heard the music on this CD it re-played in my mind all afternoon and evening, right up to retiring. I use it now to meditate, letting the flute, the chanting, the drums, transport me where it will. Peaceful, rich flute sounds-just what I was looking for. I wanted to hear some pure native american flute music without a lot of additional orchestration and new age sounds. This was just what I was looking for. The sound is peaceful, yet powerful. I listen to it often. Quality digital recordings that seem never-ending. A true value package. AS for the music, it is on level with the Masters of old and new. Mr. Cleveland is a true warrior. God's Son. What a beautiful CD. I listen to it constantly and never get enough of it. I'm looking foreward to more music from Al! Besides the wonderful, relaxing and soulful music, you just got to love a guy who dedicates a CD to his dog.